Finally, decades after the United States Air Force closed their official investigations into the UFO phenomenon, the files are online in their entirety for free. 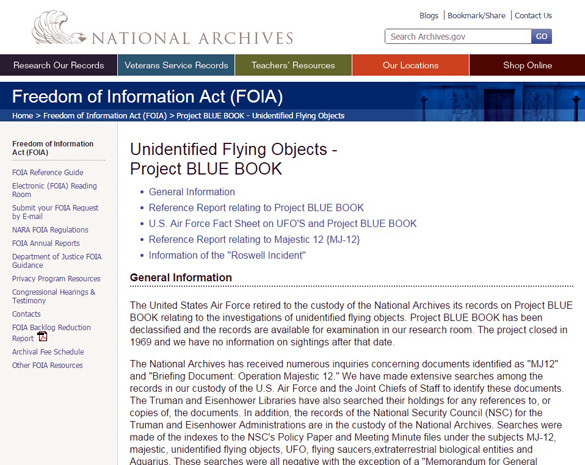 Project Blue Book is regarded as the third UFO investigation project by the USAF. The first was Project Sign, which began in 1947, then Grudge, which ran from 1949 to 1951, and the final project, Blue Book, ran from 1951 to 1969. The files surrounding the investigation of the sightings are all included in the Project Blue Book files. That is, unless, as some suggest, there are secret investigations that the public still does not have access to. 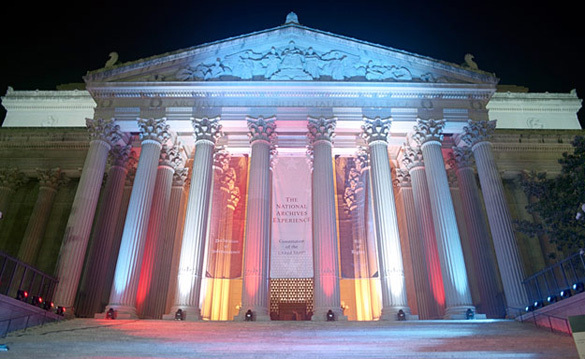 Either way, although these files have all been declassified, since the close of Project Blue Book, it has taken a trip to the National Archives to get full access to them. Some websites have put up portions of the files, and one website, Fold3, finally posted all of them a few years ago. However, visitors could just view them and had to pay a membership fee to download them. Note: Apparently you can download the files at Fold3 for free now, but it is one page at a time, and in the jpeg picture format. The Black Vault offers the files in PDF documents, making it much quicker and easier to download. Many of them are also searchable. Now researchers and UFO enthusiasts, including myself, can save some money. The files have been placed online by John Greenewald who runs a website called The Black Vault. Greenewald has been submitting Freedom of Information Act (FOIA) requests since he was a teenager to get the government to share what it knows about UFOs and other clandestine matters. He has posted these files online, and over the years has amassed the largest online repository of such materials. He has over one million pages hosted there. Now that he has finally finished the daunting task of making the Blue Book files available, he now has over 130,000 more. The staff of Project Blue Book. 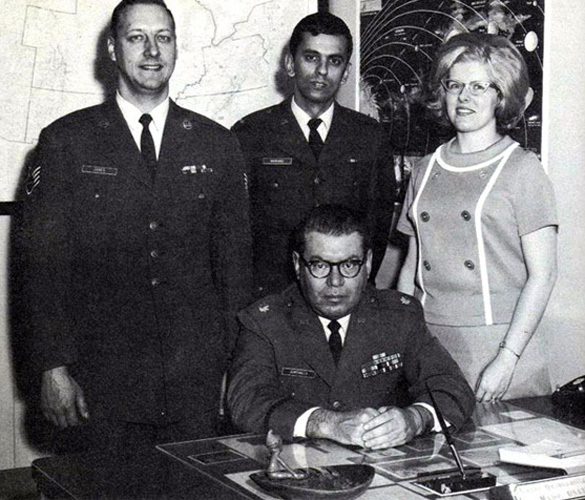 Sitting in the center is Hector Quintanilla, the last chief officer of Project Blue Book. I interviewed Greenewald to ask him some of his thoughts about posting the Blue Book files. Why did you decide to post the files? Greenewald: Plain and simple, they are UFOlogical history. There are a few sources for these records out there, some of which are incomplete, while others are harder to navigate or are not geared towards the actual researcher. So, I wanted to compile these in a straight forward, easily searchable database, and that in itself is unlike what is out there and makes this new site powered by The Black Vault a bit unique. Why do you think these files are important after all of these years? Greenewald: Project Blue Book (along with Sign and Grudge) holds a special place in UFO history. Whether or not it TRULY investigated UFO sightings in the sense we wanted it to, it doesn’t matter. It is a project that lasted for over 20 years, and they investigated thousands of cases. Sure, many of them they claimed were all explanatory, but you still have a few gems that remain a mystery. But further, you can use this data to compare and contrast to what it is today and start drawing conclusions, or rather, maybe pose new questions that investigators haven’t thought of yet. For years, this data sat on microfilm in the National Archives. Now with the power of the internet, they were brought online, but in ways that were not easily used, incomplete, or plain and simple, didn’t get the exposure it deserved. I hope this new resource changes that, spotlights this era in UFO history, and offers a research point that those in the coming years of UFO investigation can learn from, utilize, and reference. Why have they not been available online for free until now? Greenewald: To convert and archive 130,000 pages is no easy task. There are some sites that tried to create the archive… but really didn’t gear it towards the researcher or the investigator. Some charge for the information (if it’s even complete), others make it hard to download or read, and others are just incomplete. I tried with this new site to ensure that everyone could use it and learn from it. When I started The Black Vault when I was 15 years old, I was stunned by the lack of information on the internet. Now, nearly 2 decades later, many sites have caught on and archiving the data – but they want to charge you for it. Almost 20 years later, and roughly 1.5 million pages that are given away for free, I am happy to say I have kept the promise I made to myself to never charge anyone to learn. I know for myself, and for other researchers and journalists, the posting of these files will make it much easier to explore some of the hidden gems in the files. There are hundreds of files that the USAF regarded as genuine “unknowns.” The exact number is somewhat murky. As the debate over how many USAF UFO investigation cases were truly never explained continues, due to Greenewald’s work, the citizen researcher now has the ability to peruse the files without having to travel or subscribe to a membership. 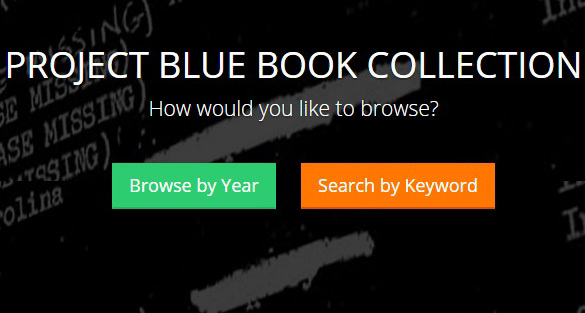 You can find the Project Blue Book cases all at this link at TheBlackVault.com. All of the material Greenwalde has on the website is a knock off of a release from September 2014. I contacted the original team behind the project and John didn’t have anything to do with writing any of the software. The BlackVault doesn’t mention anything about the other project. That right there says it all. It looks like John just downloaded the material, copied it to his website, and stuck “TheBlackVault” on every page. Bottom line, it looks like John is trying to steal the credit from the guys who originally released everything. You guys might want to update the article to credit the original group before it comes out what Greenwalde did. We are going to start posting messages on Twitter and Youtube to get the word out. There have been some people who have noticed that there was a guy who had acquired these files and posted links to them. They were around a 200 GB download. I know, it took me two days to get them. I and others, including John, had been in contact with this person who has decided to remain anonymous thus far. This person asked some of us to post them if possible. Luckily, John was able to take on the colossal effort it took to do this. John did not steal the files, he worked with this gentleman to get them online for people to have access to for free! Glad to see that information being made available in the public domain. Hopefully it can help people come to the realization that no matter who is doing the analysis, some percentage of sightings cannot be explained by conventional means. Anonymous, Greenewald did not steal the files. As I wrote in my earlier comment, he gave them to us all. Greenewald did give credit, check the credit section on the Blue Book page. Finally, yes, Greenewald was in contact with “Xtraeme”, the man who originally made them available as a HUGE download. This person wanted Greenewald to post them, and is happy that he did. People are not realizing that just having 200 GB of jpegs does not make it easy to post these online in an organized fashion. Greenewald was able to turn them into PDFs, and then get them uploaded. This was a group effort. If you begin to post that these files were stolen, that would be inaccurate and dishonest. I have no comment at this time but just to say thank you for all the information you have made available for me to read. Gee… My wife was born in 1947. Could she be an alien from out of this world? Ok and why now? Do they have an agenda, and if so, is it to finally tell us the truth about this subject? I for one have seen one and it was real to me, so maybe the American Government has finally decided to tell the truth. Were you (and John Greenwald) unaware or ignorant of this long-term, pre-existing PBB declassified files resource? I’m both perplexed and disheartened by the coverage of this story by both the mainstream media and a number of online UFO-related websites, which has been both superficial and oblivious, as if the PBB files had supposedly been only now been made available, online, for free. That is simply not the case. Aside from the ridiculous and easily disprovable claim that Greenewald has made the Blue Book files available to the public for the first time, there is another glaring problem: If Greenewald’s Black Vault files are so new and so superior, why are they redacted while identical documents at blurbookarchive.org are not? I am very confused and hope someone can help. During the early 70’s, I read a book that was suppose to have been written by a man who said he was the boss man at that time. He reported that he had a meeting with a captain of a spaceship, from another world. She took him for a ride in the spaceship, and he also saw her in a cafe, and told him that they interacted with humans, often. Does any of this sound right to anyone?